Fast-food workers and activists demonstrate outside the McDonald’s corporate campus Wednesday in Oak Brook, Illinois. At the McDonald’s annual shareholder meeting in Oak Brook, Illinois, on Thursday morning, hundreds of the company’s employees were protesting, demanding a minimum wage of $15 per hour and the right to unionize. The night before, more than 100 of the fast-food chain’s workers were arrested for crossing a police barricade. Just how far off $15 per hour are wages at McDonald’s? And how does pay at McDonald’s compare to the fast-food industry overall? There are more than 3 million people employed preparing and serving food in the United States, according to the Bureau of Labor Statistics (BLS). They’re a significant part of the labor market, accounting for 23 of every 1,000 jobs in the country. 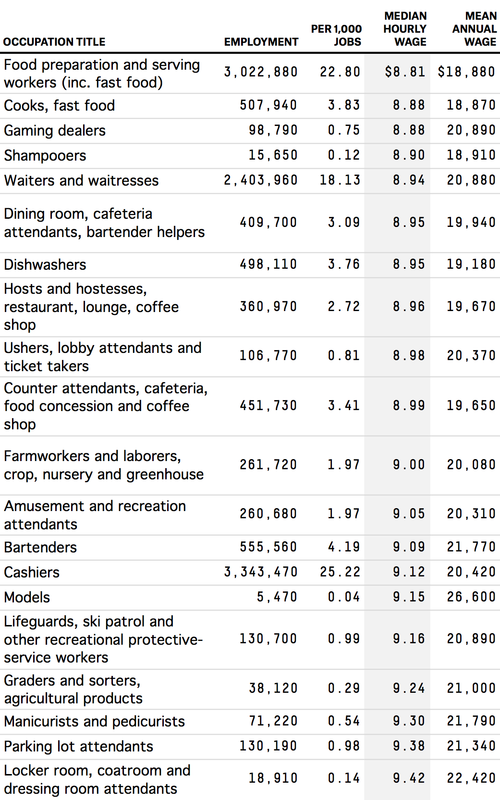 As of May 2013, the food-preparation and service industry paid an average hourly wage of $9.08. In a separate BLS category, we find over half a million fast-food cooks who earn, on average, $9.07 an hour. But that varies by industry and state. Cooks in gasoline stations earn, on average, $8.68 per hour, while cooks in grocery stores get $10.02. The San Francisco area has the highest average wages for fast-food workers in the country, but at $12.17 per hour, that falls well short of the $15 demanded by the protesting McDonald’s employees. Fast-food workers, overall, are among the lowest paid employees in the U.S. There is no clear-cut definition of a livable wage in the U.S. The official guidelines on what constitutes poverty depend on household size. With average annual wages of $18,880, fast-food workers who provide all the income in their households would only be able to support one other person without falling into poverty. The Massachusetts Institute of Technology has developed a living wage calculator based on typical expenses in specific locations. I looked at the 10 metropolitan areas with the highest employment in preparing and serving food, then compared actual wages in those places with what would be considered a living wage. Eight fell short. When I averaged the hourly wages across the 10 areas, they fell short of what would be considered livable by 91 cents per hour. And if employees in those areas needed to support a child, they would need to earn an additional $11.31 per hour. Back to McDonald’s. Because the BLS only offers data on an industry basis, we contacted PayScale, which provides individuals and employers with compensation data. The company surveys thousands of visitors to its website. According to PayScale, the median hourly wage among McDonald’s employees with five to eight years of experience is $9.15. On that basis, McDonald’s offers slightly better remuneration than fast-food chains Burger King and Wendy’s, where employees fall even further below the $15 threshold demanded in the protest.